How’s your CRM data? Missing any key metrics that would give you better insight into your business? We’re guessing that unfortunately the answer is yes. Whether your main data gap lies in blank industries, old close dates or some entirely different field, check out this sales contest idea to fix it. Getting Started: First, choose 2 of those main data points that need to be filled or cleaned. Then, instead of asking your sales team to prioritize them and crossing your fingers, set up the contest that follows. Note: We suggest making this a team-based contest, because if you ask individuals to compete against one another in this one, you set it up so that the person with the worst data-logging habits has the best chance of winning. They have the most opportunities to fix their data and/or fill empty fields. Incentive: Pay for Happy Hour at the winning team’s favorite local establishment the Friday after the competition. Let them leave work an hour early to head over there. If you typically run sales contests around more traditional behaviors, like progressing opportunities and closing deals, running something like this around CRM data quality offers a great way to switch things up and keep competitions fresh. Then afterwards you can go back into the opportunity progression contests with better sales insight. 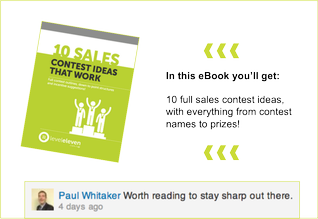 Want more sales contest ideas? Check out this free eBook. Need better sales data? Check out this sales contest idea.